Rating: 5 out of 10 Reviewed from 124 flights with 1234 photos. NEWS: Turkish Airlines has made one of the world's largest commercial aircraft purchase tenders, buying 105 planes valued at US $6 billion. This includes 25 wide-body, long-haul planes and 50 narrow-body, short-haul aircraft. Turkish Airlines reviews are surprisingly good - that is, once you get past checkin. 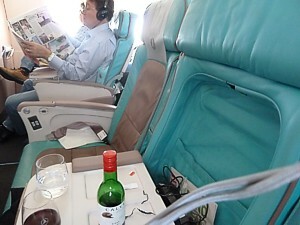 The poor quality of the staff, and the lack of trainning is noteworthy, so it is surprising that the aircraft are generally brand new, with full service, a free bar and food and new seatback TV. Turkish Airlines has a pretty large fleet, with 116 aircraft. It is a firm fan of both Boeing and Airbus, and never seems to be able to make up its mind which one it prefers. 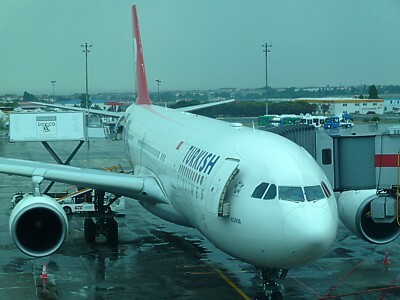 Turkish Airlines also are among that rare breed of airlines which offers four classes long haul, and two shorthaul, although not altogether, and certainly not by design. One thing you are sure of is that Turkish Airlines have seatback TV IFE on all longhaul aircraft. 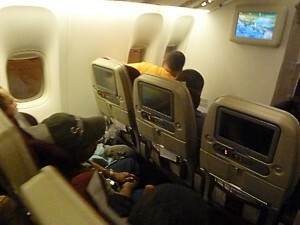 ...read more about Turkish Airlines IFE. Long haul, Turkish Airlines generally use the Boeing 777 for their flagship routes. However, there are two different variants, and this can make a significant difference to your journey. Turkish Airlines have 11 Boeing 777s of its own, and three 'specials', which are on lease from Jet Airways of India. 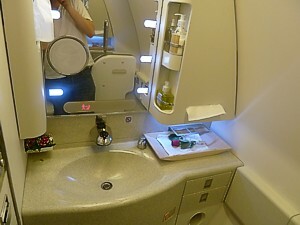 The normal variant of the Turkish Airlines Boeing 777-300ER has no First Class, but 28 in business class, 63 in Premium Economy, and 246 in economy down the back. 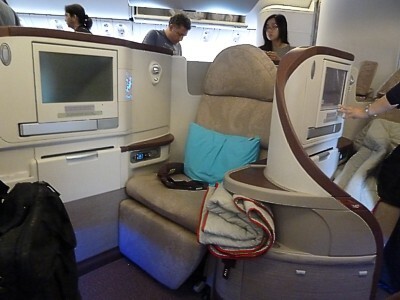 The mainline versions of Turkish Airlines Boeing 777-300ER do however have the great delight of Premium Economy. A Turkish Airlines Comfort Class review has to mention that the seats are in a 2-3-2 layout, which makes them seem far less cramp than usual economy - plus of course there is all that legroom. The best seats for Turkish Airlines Comfort Class undoubtly have to be the ones at the back, because of Turkish Airline's odd habit of filling the aircraft from the front. They run from row 11 to row 20, and most people prefer row 16 back. The seats are not only good - they look good too, which explains the sheer audacity of many passengers in economy who attempt to self-upgrade themselves to Comfort Class. This happens consistently, however boarding passes are always checked, the manifest examined, and the interlopers are booted out. However, mid flight it will happen again, and if you go to sleep with an empty seat beside you, chances are your belongings will be dumped on the floor and a stranger from back in economy will be in that seat. You can prevent this to some extent by extending the tray table and putting large bags on the seat, but you've got to be determined. It is one of the rare instances were crew will be efficient, if you point out to them there is a self upgrader. There are of course three special Turkish Airlines Boeing 777-300ER which are on lease from Jet Airways of India. These are a very different beast, if only because they have First Class. In Business Class the seat is very obviously the Virgin Atlantic Upper Class seat, and it is the classic flatbed on a curve business class seat. You fly at a 45 degree angle to the direction of flight, but this is no bad thing considering every seat has access to the aisle. There is no premium economy on these aircraft, however economy is still in the 3-3-3 layout that gives much more width on the flight, compared to other operators. Although Turkish Airlines prefers using Boeing for its prestige routes, there are some where the greater range of the A340, or the fuel economy of the A330 are better, and Turkish Airlines of course thinks nothing of having a mixed fleet with both these types. Turkish Airlines has nine of the four-engined Airbus A340-300 series, along with 7 of the A330-200, and another 7 of the larger A330-300, however they are pretty similar inside. 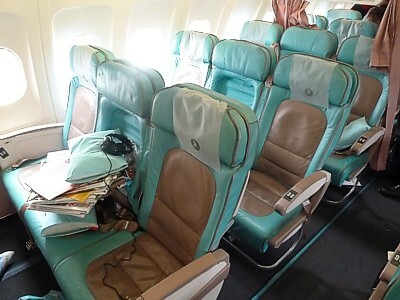 Business Class is in A330s arranged in just 4 rows of 2+2+2. There are no less than three variants of the A330, with some (5 aircraft) having a 61" pitch, two (JNF, JNG) have a 55" pitch, and seven (JNH-JNN) have the new seat with 76" pitch (which reclines to 177 degrees. The A340 has 6 rows of 2+2+2. The old style upright seats are ok, with plenty of cubby holes to put things in, on the 7 older A340, while 2 newer A340s (registation JIJ and JIK) have a 73-77" pitch. Row 1 gets a bulkhead with loads of legroom - and unfortunately basinette fittings. If you don't want to be blighted by sitting next to a couple with a crying baby, ask if there are any children onboard before asking for this seat. At least the seats are fairly modern, with a pitch of 54 inches, and width of 21 inches. It reclines electronically to lie at a slope of 160 degrees. On the A330 there is a small walk up bar at the front of the cabin, in front of 1D and E. These seats are great if you want a drink, but to be avoided if you want to sleep. Economy Class is in a 2+4+2 formation, giving a marginally narrower seat than the 777, however it is ideal if you are flying as a couple, as it means the end of clambering over two people when you want to leave the window seat. Turkish Airlines reviews always show that although not very notiable, the extra pitch (slightly better than on the Boeing 777) of 33 inches really does help longhaul. The seats have a video screen, and have the remote clamped into the arm. In the A330s row 5 gets a bulkhead, while row 22 gets an emergency exit, but it is blighted by light spill from the toilets ahead of this seat. On the A340, the bulkhead seat is row 7, while the emergency exit is row 23. For most of your flights around Europe and middle east, Turkish Airlines use the single aisle Airbus, in three variants. It has 10 of the small Airbus A319, 27 of the midsized A320, seating 8 in business class and 138 in economy, and 27 again of the big long A321, seating 12 in business and 165 in economy. 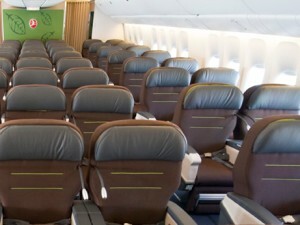 The A320s seat 135, in economy with a 3-3 layout. Row 17 and Row 18 are the overwing emergency exit - if you ask to sit here, you will get 2 inches more legroom. Row 18 is highly prized, as the seat here reclines fully. Pitch is 33" and width is 17". All models have large 14 inch fold down LCD TV screen under the overhead lockers for both classes. Service can be a bit slow, with only a single aisle for service. As is usual, Turkish Airlines haven't fitted special seats for the business class on the Airbus 320 - instead, the seats use the Lufthansa style variant with a flip-down console in the middle seat, which makes a small cocktail table for business class in a 2-2 cabin layout, and then beyond the curtain can be flipped up again for the 3-3-3 of economy. Other than that, in Business Class the seats are identical, although you do get the perks of uprated headphones in these seats, although as the IFE normally consists of just one short comedy, there's little point. Turkish Airlines has a solid fleet of 69 Boeing 737s, almost all of which are the new Boeing 737-800 type. Although initially they were used mainly for domestic routes, many are now finding their way onto all the European routes too. 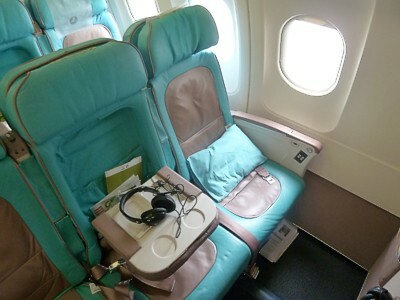 Business Class seats are in a 2+3 layout, with the A and C seats are made from a normal set of three seats, with the armrests pushed closer together to give lots of seat width. It is recommended going for these seats, but here rows 2 and 3 are the best, as row 1 is the bulkhead row, which gives you nowhere to stow bags containing things you want quick access to. All planes have had a minimum of three business class rows, but with just a sliding curtain that can move according to demand, and sometimes you'll find your seat moved if the curtain moves, thanks to a sudden influx of people in the cheap seats. On the other hand business class can go all the way back to row 20. Economy is in the usual 3+3 pattern, with row 10 being the emergency exit seat, with a lot more legroom.